Strike a Light is organising a free day long event at Fabrica gallery www.fabrica.org.uk on Tuesday 6th December 11-4pm called ‘Relativity’ about the theme of the family, including films, creative workshops, talks, story telling and family portrait drawing. It is aimed at all, but especially older members of the community. (Some transport is available for elderly groups- please get in touch with me to arrange this). To book for larger groups, please use the contact details on attached poster. In addition, there will be a film showing from 6-8.30pm also on Tuesday 6th December at Fabrica of Mid-Summer Lunch, a quirky screening chronicling a food-filled nonagenarian sleepover, catered for by the only cast member under 60! Come along after work or after the event for this cosy event with sofas, cushions, cocoa, mulled wine and nibbles for the entry price of £1! A perfect antidote to the cold outside. The newly inaugurated Venus Fly Taps are performing at Strike a Light’s Hope Springs Eternal Event this Saturday October 29 at 8pm in Pavilion Gardens, Brighton! *** 8.00 pm The Inaugural Busby Berkeleying in a Public Place – chorus line performance of ‘We’re in the Money’ to open the event Hope Springs Eternal in the Pavilion Gardens, just in front of the cafe. QueenSpark Book launch a success! Thank you to all those who attended the launch of the QueenSpark Books Photo Collection last night ; for those that didn’t, it is now online at www.photosbrightonandhove.org.uk – images are being added all of the time, so there is plenty to see – and why not dig out your own photographs and add them to the Collection too? Radio interview on Radio Reverb with Melita Denett and me about QueenSpark Books 100th book publication and launch tomorrow at The Old Courthouse. Come on down if you’re about tomorrow 6.30-8pm in Brighton for a free glass of wine and a look at our online photo archive. White Night programme is out! The exciting new programme of all the free events in Brighton for White Night on Saturday 29th October is out now. See it here, and check out Strike a Light’s event whilst you’re at it! Queenspark Books 100 mile celebration! To celebrate QueenSpark’s 100th book, Nicola Benge donated the proceeds from her 100 mile Walk-A-Thon. 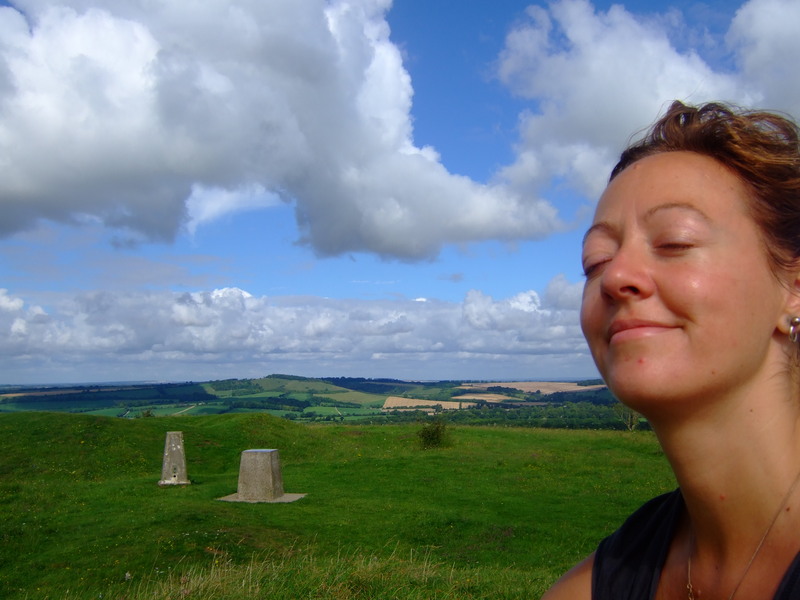 This sponsored walk in August 2011 took Nicola along the entire South Downs Way from Winchester Cathedral in Hampshire to Eastbourne, East Sussex – 106 miles, and only one blister! Nicola would like to thank everyone for sponsoring her and QueenSpark would like to thank her for her contribution towards funding the archiving of local heritage and memories. The online Collection features hundreds of never-seen-before historic and contemporary photographs, freely donated by the public, and fully searchable. QueenSpark’s new book ‘Brighton & Hove Photographic Collection – Volume 1’ is a selection of 50 images from the Collection, and will be on sale at a special discounted price at the event. Search for a photograph – by decade, location or theme – curate your own collection for others to view, and upload your own images at www.photosbrightonandhove.org.uk (from 20th October). QueenSpark would like to thank Kevin Bacon, and the Royal Pavilion & Museums, for their support. The QueenSpark AGM will take place on Thursday 20th October, at 5.30pm, at the Old Courtroom, Church Street, Brighton. If you would like to attend, please telephone 01273 571710, and leave your contact details – we will then send you the relevant documents.